This map shows the suggested interpretive area for World Heritage Status including Turtle Mountain (on the Medecine Line/Canada-USA border), Knife River (to the Southwest; South of Lake Sakakawea and the Mandan Villages), and Devil's Lake (to the Southeast). The current International Peace Garden complex rests at the centre of Turtle Mountain. The representation on the landscape of the Mythological Turtle and Serpent are outlined in the centre of this interpretive area. 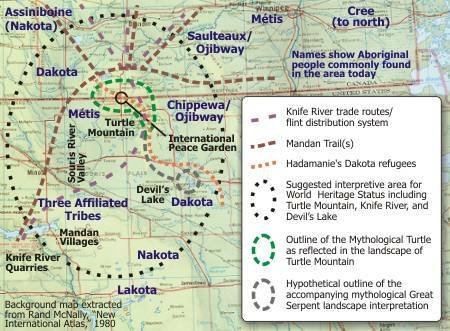 Turtle Mountain represents the Turtle, and the higher ground (glacial moraine) stretching from the Turtle's tail toward Devil's Lake represents the Serpent. The three important routes indicated on this map are the Knife River trade route and flint distribution system, the Mandan Trails, and Hadamanie's Dakota refugee migration. The Knife River route moved flint from the Knife River quarries up the glacial ridge over to the northern side of Turtle Mountain, and returned raw materials from that glacial frontier back down to Knife River. The Mandan Trails were longstanding trade routes that proceeded from the Mandan Villages, passed through the Souris River Valley, wrapped around the western and northern slopes of Turtle Mountain, and continued on towards the Red and Assiniboine Rivers. Hadamanie (a Dakota diplomat and leader) followed in the mythological footsteps of Hero Boy to lead refugees of the American Indian Wars to safety on Turtle Mountain. This route passed from Devil's Lake, through the "crack in the Turtle's Back" to the Northwestern slope of the mountain. For reference, the names of Aboriginal people commonly found in the area today are included: Cree, to the North; Dakota to the North and South of Turtle Mountain; Métis around the mountain's slopes and to the Northeast; Saulteaux/Ojibway to the Northeast of Turtle Mountain; Chippewa/Ojibway to the Southeast; Assiniboine (Nakota) to the Northwest; Lakota and Nakota to the South and Southeast; and members of the Three Affiliated Tribes to the Southwest.